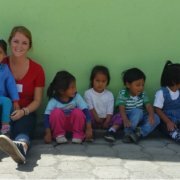 You have the opportunity to spread the word about Global Volunteers by sharing your unique volunteer story with friends, family, neighbors, school groups, and colleagues AND earn credit for your next service program – as a thank you from us to you for your time and talent. You could be on your next service program for virtually free before you know it. Not only will you benefit financially, but so will your referrals! Your recommendation is worth a $200 service program discount to every new volunteer you refer. Give this “Gift of Service” discount to anyone you think might be interested in volunteering. There are no limits! 3. And you’ll be tremendously helping the host community! So far, you will receive Global Volunteers credit, your referral reduces the program expenses for your friends and family, but most importantly, the communities we serve get much needed volunteers. 4. Because you’ll get to talk about your volunteer experience as much as you want! When most volunteers return from their service program, they can’t stop talking about it. They feel inspired and want others to experience what they did. This is a perfect opportunity talk and share your story as much as you want! Adding “Global Volunteers’ Alumni Program” to a resume, LinkedIn profile and college/job application could put you a step ahead of your peers. Two people with the same degree, work experience and age are likely to have a similar chance at getting accepted/hired. But a person showing commitment to volunteering, especially volunteering abroad, has an advantage. They have a deeper cultural and global understanding. View our Alumni Program page to learn more about joining the team. Or, email Dana Faust, our Volunteer Engagement Manager, at dfaust@globalvolunteers.org to get started. We look forward to working with you! My Last Day in Chennai I decided to leave “my comfort zone” and go to St. Lucia.